Nokia has recently introduced their Nokia 500 Auto Navigation System which can do more than tell you directions but also acts as a complete hands-free system that will allow users to see who's calling and also make quality hands-free calls. The Nokia 500 Auto Navigation system is Nokia's first handsfree dedicated personal navigation device, a previous model was only a GPS system. 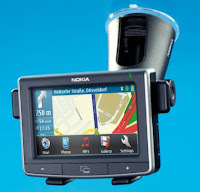 The Nokia 500 Auto Navigation System is a complete in-car solution. The device has a wide 4.3 inch color screen that will allow users to view their contacts more clearly and a hands free speaker system that has Digital Signal Processing (DSP), providing for excellent audio quality. The Nokia 500 Auto Navigation System is also equipped with a sensitive Global Positioning System (GPS) and Nokia's Maps navigation software. The device can give users detailed directions in every turn and includes street and city names. These directions can be given in an automated voice or visually, through the device's screen. Nokia has pre-installed regional maps on the device as well as travel information and points of interest. A cool feature about the system is that it can let you receive contact details for the points of interest you pass so you can call directly. Since the Nokia 500 Auto Navigation can integrate with your cell phone, it also allows you to get directions to addresses stored in your contacts. The device also features a split screen for easier navigation. The split screen displays additional information such as the next turn, distance remaining, and estimated time of arrival. A Traffic Message Channel Service is also included in the Nokia 500 Auto Navigation System so users can get to their destination quickly by avoiding those traffic jams. Sounds cool..Nokia is indeed trying hard!